Tourism in Afghanistan was at its glorious best in the 1970s. Over 90,000 tourists visited Afghanistan from all over the world to see the unique beauty of the Country and experience the treat of one of the most hospitable groups of people. Today, despite decades of war, Kabul remains a fascinating city that embraces both the old and the new. With the ever-increasing presence of the international community and the ongoing redevelopment projects, Kabul has been given a touch of modern architecture that gives the city hope of a peaceful and prosperous future. Afghanistan has also been of great strategic importance for invading armies, from Genghis Khan to Alexander the Great. All these armies have left astonishing trails behind, trails that have been forgotten due to decades of war but are yet to be discovered. The Government is working to rebuild the war-torn infrastructure of Afghanistan, a major project to develop transport links and a nationwide telecommunication link between Kabul and the other provinces has been established. Furthermore, to assist the Tourism Industry of Afghanistan, the Government strongly encourages and offers its full support to the private sector to invest in the Tourism Industry. With ever-increasing global tourism, the Afghan Tourist Industry has tremendous potential to become profitable. The Ministry of Foreign Affairs of Afghanistan is willing to support any attempt that will further develop the tourism industry of Afghanistan. Kabul, the capital of Afghanistan since 1776, is a fast growing city where tall modern buildings nuzzle against bustling bazaars, wide avenues are filled with colorful flowing turbans, gaily striped chapans (cloak) and a multitude of handsome faces. The city is ringed with mountains gleaming emerald green in spring and glistening white in winter. In summer, they have an ever-changing beauty turning from deep purple to brilliant pink under the rising and setting sun. Two craggy ranges crowned with ancient bastions divide the city and the Kabul River flows through a narrow pass between them to meander through the heart of the city. Travelers have written glowingly of Kabul for centuries and modern visitors continue to be captivated by its charm. Rising above the plain, the citadel (ca. 6th C. A.D.) served for centuries as the seat of the rulers of Afghanistan. It witnessed most of the exciting events of the country’s history until 1880 when it was destroyed during the Second Anglo-Afghan War. OLD CITY WALLS: The ancient walls of Kabul begin at Bala Hissar. They are 7 meters high, 3meters thick and assigned to the Hephthalite period (5th Century A.D.). A charming landmark of the city is the mausoleum of Amir Abdur Rahman, one of Afghanistan’s most dynamic rulers. It stands in Zarnegar Park, in the center of the city as a fine example of the 19th Century architecture remaining in Kabul. Laid out by Babur, the founder of the Moghul Dynasty, in the middle of the 16th Century, the gardens include a summer pavilion added by Amir Abdur Rahman Khan, a commemorative mosque built by Emperor Shah Jahan and the tomb of Babur himself. Babur died in Agra in 1530 but he so loved these gardens that he asked to be buried here, a wish which was fulfilled by his Afghan wife Bibi Mobaraka. Kabul’s many colorful bazaars attract a large number of visitors for shopping and sightseeing. Kocha-e-Murgha (Chicken Street) in Shahr-e-Now is the most famous. Istalif lies to the north of Kabul in the Koh Daman, a valley ringed by barren hills dotted with villages nestled within green orchards. It is one of the largest, most ancient and loveliest of all the valleys. Istalif is famous for its green and blue pottery and its picturesque bazaar. A visit to this place combines beautiful scenery with an introduction to Afghan Village life. Ghazni, an important market town, particularly famous for embroidered sheepskin coats, was the dazzling capital of Ghaznavid Empire from 994-1160 encompassing much of northern India, Persia, and Central Asia. Many campaigns in India were launched from here resulting in the spread of Islam to the East. This glorious city was razed to the ground by Arab invaders in 869, by the Ghorid Sultan Alauddin in 1151 and by Genghis Khan in 1221.The city did not recover its former grandeur, however, it enjoys a strategic position in the country’s economy. Kandahar, the birthplace and first capital of modern Afghanistan, founded by Ahmad Durrani in 1747, today home to less than a million people, is located on the Asia Highway halfway between Kabul and Herat. The area is rich with ancient history. Here, Alexander the Great founded Alexandria of Arachosia and the region was repeatedly fought over for by the Staffavids and Moghuls. It was the independent-minded Afghans of Kandahar, first under the leadership of Mirwais Hotaki, its mayor and then of Ahmad Shah Durrani, who hastened the decline of both empires and annexed much of their territories to the young Afghan Kingdom in the 18th Century. Ancient Lashkargah Bost now lies to the south of the modern administrative town. The Bost is recognized in the Zoroastrian hymns of the AVESTA, in Achaemenid town lists and in 1st Century accounts. These references, however, are vague but there is no doubt that the citadel was taken by Arab conquerors around 661A.D. In the 9th Century, the city grew to become the second city of the southwest. An Arab traveler in the middle of the 11th century describes the city as: ” one of the principal cities in the province of Seistan, except Zaranj, no city is larger. The inhabitants are polite and generous. It is a city well supplied with provision, fruits, and dates.” From the 11th until the middle of the 12 Century, Bost prospered as the winter capital of the Ghaznavids, was burned and looted in 1151 by the Ghorids and then completely demolished by Genghis Khan in 1220. This history of Herat has been one of repeated destruction and reconstruction. Conqueror after conqueror, from the time of Alexander the Great, has taken it, destroyed it and then rebuilt it. In the 4th Century, B.C. Alexander the Great built the fort which is still standing in the center of the City. From 1040 to 1175 the city was ruled by the Seljuks who defeated the Ghaznavids and destroyed the fortress. 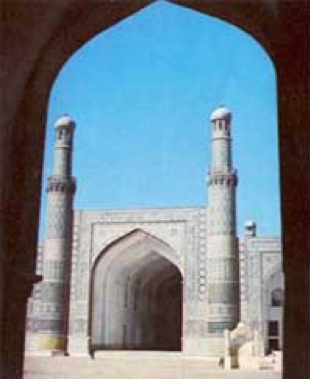 Herat was then captured by the Ghorids until the city fell under the control of the Khwarazm Empire. In 1221, Herat was taken by the Mongols and Tuli, the son of Genghis Khan, who ruled for a time, but the citizens revolted and killed the Mongol garrison chief. Extremely angered, Genghis Khan rode upon the city with 80, 000 troops and besieged it for six months, leaving only forty people living. In 1245, Herat was given to the Kart Maliks. Tamerlane destroyed Herat in 1381. However, his son, Shah Rukh, rebuilt it and started the cultural renaissance which made it the center of learning and culture. During the Timurid rule, the famous poet of Herat, Jami and the miniaturist, Behzad were born, Queen Gawhar Shad’s Musalla was built and Gazergah restored. For the second time in its history, the city flourished. In 1718 the Afghan clan, Chief Hotaki, struggled for Herat’s independence which continued until 1880, when finally the city became an integral part of Afghanistan. This fort, originally built by Alexander the Great, suffered repeated attacks over the history, but still dominates the landscape of Herat. Held by the Ghaznavids, the Seljuks, the Ghorids, the Mongols, the Timurids, the Safavids and others, the citadel is a reminder of the times of kings, conquerors, and great pageantry. This great mosque, in the center of the city, has been a place of worship since the time of Zoroaster. Rebuilt several times, the mosque now stands in perfect splendor. One of the greatest 15th Century poets, Mawlana Nuruddin Abdur Rahman Jami, born in 1414, achieved widespread fame during his lifetime. He died in Herat in 1492 and is buried in a grave unadorned, save for a pistachio tree which has sprung from the tomb itself. En route about 240 km from Kabul (12 km from Pule Khumiri) lies Surkh Kotal, site of a great religious temple, founded 130 in A.D. by Kanishka the Great, King of the Kushans. It is one of Afghanistan’s most important archeological sites, which was finally burned by the Hephthalites, nomadic rivals and ultimate successor to the Kushans. 70 km further north lies Aibak, the capital of the Samangan province. 2 km nearby is an important Buddhist site, dating back to the 4th Century A.D., locally known as Takhte Rustam (Rustam’s Throne). Rustam, the hero of Firdausi’s great epic, the Shahnama (Book of Kings), written in Ghazni around 1010, married the beautiful daughter of the King of Samangan, Tahma. The stupa cave crowns the hill in front of the monastery which was most probably destroyed by Hephthalites around 460 A.D. 60 km north is Tashkurghan (Khulm) with one of the last traditional Central Asian Covered Bazzars left in Afghanistan. A stroll through this bazaar is a special interest. So are the Bala Hissar, the charming palace of Amir Abdur Rahman (Baghe Jahan Numa) and the tomb of Qilich Ali Beg, the most notable ruler of Khulm (1786-1817). Mazar-e Sharif, the capital of Balkh province, is a major trading center famous for Karakul, a great variety of traditional Turkman carpets and high-quality, long-staple cotton. The city is named for the magnificent shrine of Hazarate Ali, cousin and son-in-law of Prophet Mohammed, the Fourth Caliph of Islam. Hazarate Ali was assassinated in 661 and buried at Kufa, near Baghdad. Local tradition, however, relates that his followers, fearing enemies may take revenge on the body, placed his remains on a white she-camel which wandered until she fell exhausted. On this spot, the body was buried. All knowledge of the final resting place was lost until its existence was revealed and the great Seljuk Sultan Sanjar ordered a shrine built here in 1136. 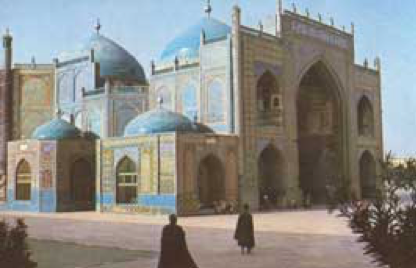 Genghis Khan destroyed this building and again the grave lay unmarked until a second revelation during the reign of the Timurid Sultan Husain Baiqara. He ordered an elaborate shrine constructed in 1481. None of the 15th Century decoration remains but modern restoration has returned the building to its original beauty. Thousands of white pigeons make their home there. Amir Sher Ali Khan lies buried here with another member of Amir Dost Mohammad’s family. The largest tomb is that of the Amir’s illustrious son, Mohammed Akbar Khan, who played a prominent role during the First Anglo-Afghan War of 1838-1842. Balkh, today only a small town, is very famous for its glorious past. Zoroaster preached here sometime in 6th Century B.C. Rites at the shrine to Anahita, Goddess of the Oxus, attracted thousands during the 5th Century and Alexander the Great chose it for his base in the 4th Century B.C. Under the Kushans, when Buddhism was practiced throughout Afghanistan, many holy temples flourished in Balkh. The Arabs called Balkh Umm-ul Bilad, the ‘mother of cities’. By the 9th Century, during the rule of the Samanid Dynasty, about 40 Friday Mosques stood within the city. This exquisitely ornamented mosque also referred to Haji Piyada, is the earliest Islamic monument yet identified in Afghanistan. Jalalabad lies 150 km east of Kabul, passing Kabul Gorge, Naghlu, Sorobi and Darunta Lakes. The capital of Ningrahar province is an oasis ringed by mountains. Palaces, large gardens, and tree-lined avenues speak of its long history as a favored winter capital. Today hundreds of small villas indicate its popularity as a resort town. Among many festivities taking place in this city, the most famous and outstanding are the Mushaira or Poet’s festival dedicated to Jalalabad’s orange blossoms and Waisak, a religious Hindu festival. 11 km south of the city lies Hadda, one of the most sacred spots of Buddhist world dating from the 2nd to the 7th Century A.D. Countless pilgrims from every corner of the earth come to worship at its many holy temples, maintained by thousands of monks and priests living in large monastery complexes. Even during his lifetime, Buddha visited Hadda. This important archaeologist site is still under excavation with much of it turned into an open-air museum. Bamiyan, with its archeological remains, is the most conspicuous tourist site of Afghanistan. The village lies about 2500m above sea level, 240km west of Kabul and attracts thousands of visitors annually. The exquisite beautyof this valley is embraced by the snow-capped range of the Kohe Baba mountains in the south and in the north by the steep cliffs in which massive images of Buddha are carved. The pastel colors of its surroundings give visitors an impression of the magnificence and serenity of nature. The area of Bamiyan developed under Kanishka the Great to become a major commercial and religious center and the smaller statue of Buddha (38m high) was built during his reign. Two centuries later the colossal Buddha statue (55mhigh) was carved. Thousands of ornamented caves, inhabited by yellow-robed monks, extended into Folladi and Kakrak valleys where a smaller statue of Buddha (6.5m) stands. Pilgrims from the entire Buddhist world pour into Bamiyan to admire its spectacular and sacred sites. Bamiyan fell to the Islamic conquerors in the 9th Century. This beautiful valley, embraced by picturesque mountains of fascinating formations and glooming ever-changing colors, with a clear sparkling stream, full of trout, leads into a breathtaking chasm and is an unforgettable site for every visitor. Visitors to Afghanistan have marveled at the country’s natural beauty. The formidable Hindu Kush, the vast Turkestan plains, and the seclusion of the southern deserts have impressed travelers from Alexander the Great to Marco Polo. It is the unspoiled natural beauty that forms the visitor’s first and most enduring impression of the country. 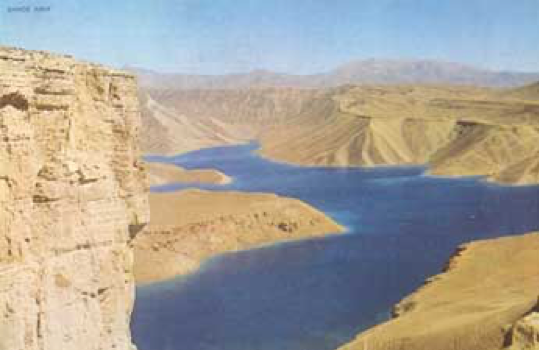 But of all the natural wonders of Afghanistan, the lakes of Bande Amir are perhaps the most outstanding. Situated in the mountainous Hazarajat at an altitude of approx.3000m, 75km from Bamiyan, these majestic blue lakes are of legendary beauty. The Central route from Kabul to Herat is undoubtedly a fascinating experience but should only be undertaken by adventurous or pioneering travelers. Passing the first highlights, Bamiyan and Bande Amir, this route leads via Panjaw to Cheghcharan, the capital of the Ghor province. The road continues via Sharak towards the north, wherein a lonely, remote valley, closely surrounded on all sides by towering barren mountains stands the 65m high Minaret of Jam, at the southern bank of the Hari Rod River. Only the Qutob Minar in Delhi, built by Qutbundin after conquering India, is higher. It is the only well preserved architectural monument from the Ghorid period. 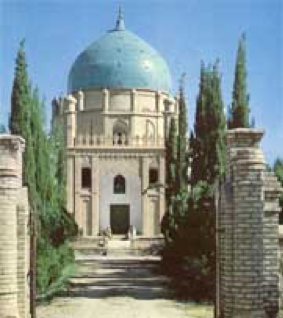 En route to Herat, the Ghorid tombs of Cheste Sharif and the hot mineral springs of Obay are favored stopovers. Most road buildings occurred in the 1960’s, funded by the U.S. and the former Soviet Union. In 1964, a road and a tunnel were built through the Salang tunnel, connecting northern and southern Afghanistan. A highway connecting the principal cities of Heart, Kandahar, Ghazni, and Kabul with links to highways in neighbouring Pakistan formed the primary road system. Sine 2001, many sections of Afghanistan’s highway and regional road system are undergoing significant reconstruction. The U.S. (with assistance from Japan) completed a highway linking Kabul to the southern regional capital, Kandahar. Construction is soon to begin on the next phase of highway reconstruction between Kandahar and the western city of Herat. The Asian Development Bank has nearly completed a road reconstruction project between Kandahar and Spin Boldak, located at the southeastern border with Pakistan. Afghanistan’s national airline, Ariana, operates domestic and international routes, including flights to New Delhi, Islamabad, Dubai, Moscow, Istanbul, Tehran, and Frankfurt. A private carrier, Kam Air, commenced domestic operations in November 2003. Provides 24-hour security, off-street parking. Provides Kabul’s famous Kebab night every Thursday. Major hotel’s such as the Inter-Continental and Mustafa hotel, as well as numerous internet cafes around Kabul, offer internet connection. International and Afghan dishes are readily available in many of Kabul’s modern restaurants.
. Named after a Croatian national song, the Vila Velebita in Wazir Akbar Khan is the latest on Kabul’s growing list of restaurants. The Velebita offers seafood, steaks, wood-fired oven pizzas ($5-8) and more, with all ingredients flown in from Germany and Italy. It is the pricier league of Kabul international restaurants. Sufi is an Afghan Restaurant managed by a foreigner and provides anything but your standard lunchtime fare. As soon as you enter the candlelit room you feel as though you’ve just entered the land and time of Ali Baba. All the plates, glasses and interior furnishing are Afghan and the room is filled with brightly colored carpets and cushions. There are also tables and chairs for those who prefer not to sit on the floor and cutler is also provided. Afghanistan offers the visitor a rich selection of handicrafts such as luxurious Afghan carpets, karakul coats as well as Afghan fur overcoats and jackets. Embroidered material, caps, and waist-coats, hand-woven silk fabrics and antiques are some of the items that tempt the traveler. Exportation of antiques requires authorization from appropriate authorities. Purchase of artifacts belonging to the Kabul museum or heritage of Afghanistan is punishable by law and will be confiscated.